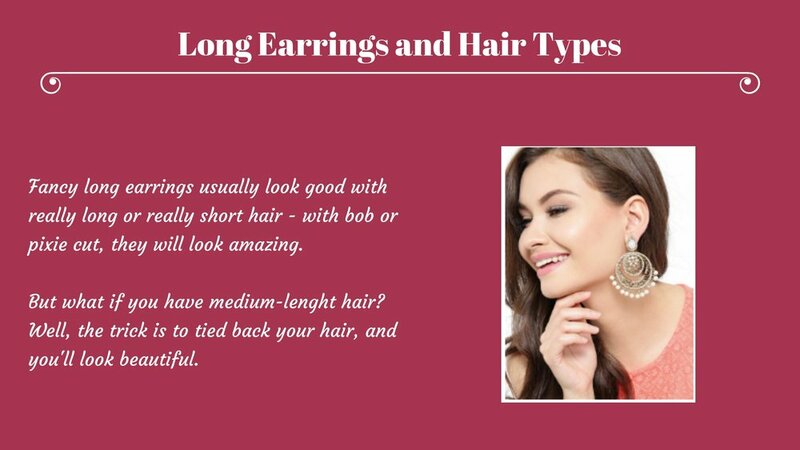 By wearing long earrings, you can create many different looks, and obtain many types of outfits, according to your mood or taste. But what's the best way to wear them, depending on their shapes or material? In this article we'll try to give an answer to this question. You have to realize that long earrings are not just accessories: the design of long earrings plays an important role in that sense. If worn in the right way, they become an important part of your outfit, and if you learn to wear them strategically, you will have some tricks to enhance your beauty! So here's the main thing about long earrings: there are many ways to wear them, you just need to discover which is the best one for you. And how should you match other accessories such as necklaces and bracelets? Keep reading the article! But more in general when you wear long showy earrings, remember that other jewels should not be too close to them. What does it mean? Well, just that you have to balance your outfit. Wearing long earrings means drawing attention to you. But we're sure you don't want to look overdone or excessive: so here you find some tips to enhance the best of you. For example, with long earrings feel free to wear maxi bracelets, but try to avoid colored or too rich necklaces- and also chokers. A great compromise could be wearing a necklace that leaves your neck uncovered: long necklaces that fall on your chest would be perfect. You don't like necklaces? So why don't you wear a big, important, colored ring? It would be a cool balance with your fancy long earrings. Another thing to know about long earrings and accessories: they need not necessarily be coordinated or identical! It means that the design of your long earrings can be different from the one of the other accessories you wear. The important thing is that they must have something in common: maybe the colour, or the material, etc. And why don't you try to match your fancy long earrings to your pursue? Yes, that's another tip! When you wear long earrings, you can avoid wearing other jewels and try to match them with a small super coloured purse. Big bags would make the outfit too exaggerated: choose a small bag or a clutch - they will fill your style perfectly! Of course the most important thing is always how you feel in your clothes: if you like your style, if you feel comfortable with it. But if you pay attention also to your body size, it would be easier for you to find the right balance to enhance your outfit, but also you body! 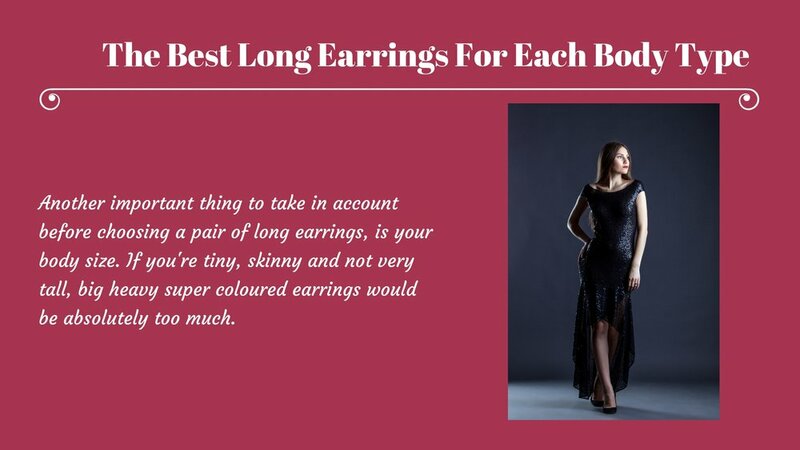 So, if you're tall, no worries: you can wear big long earrings of every kind: black long earrings, fancy long earrings, super coloured long earrings, and if you need some inspiration just go to check some pictures about long earrings online! You will be surprised how many kinds of long earrings you can wear. What if you aren't very tall? Can't you wear long earrings? No, of course you can! But try to choose thin and delicate long earrings, without big stones: they can also be very long, even down to your shoulder, but the important thing is their shape. For example if you're going to the office, or to the University, or to a job interview, wearing long earrings would be too much, because it would not be appropriate business attire - even more if they are too flashy. So before wearing long earrings, just ask yourself: ''Where am I going? Would it be too much?''. And if you're in trouble, avoid wearing them! Maybe now you're thinking: Why did I buy a pair of long earrings if I can't wear them?! Don't worry: there's always a good reason to wear them, and you'll have the right occasion for sure. For example they absolutely match with evening dresses, summer dresses, coloured saree, and of course with sweaters and everyday attire. But pay attention to the combination of colours: don't wear -for example- yellow long earrings with a neon green dress! 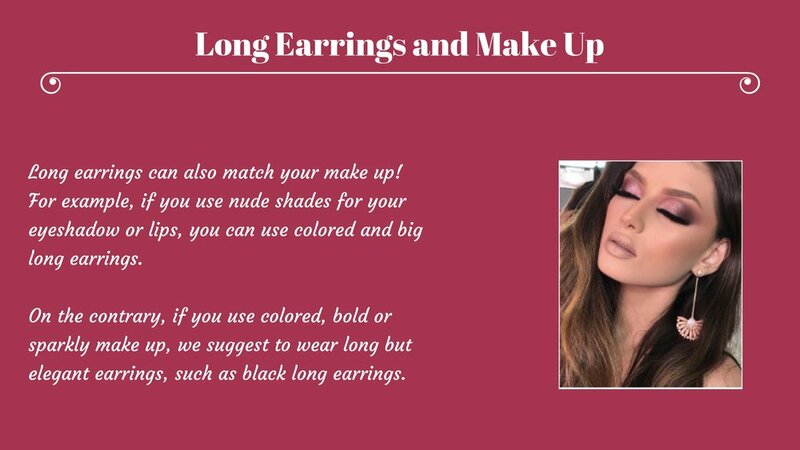 On the other hand, contrary to what is usually thought, wearing long black earrings is so much easier, since they match with lots of outfits: fancy or not. 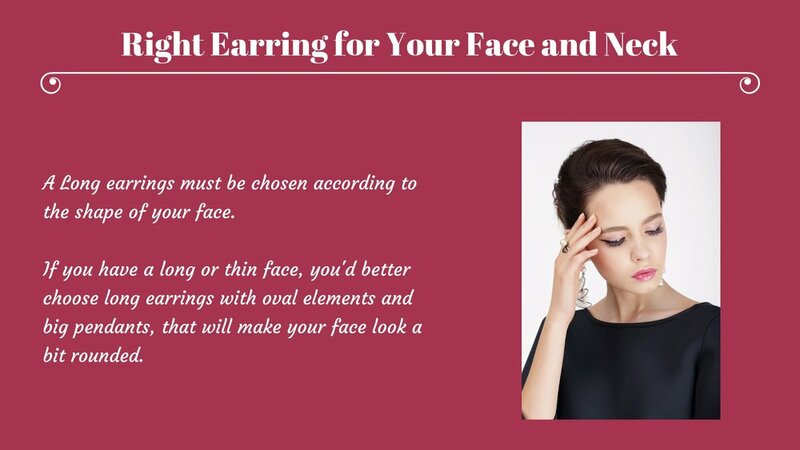 On the contrary, if you have a round face choose thin long earrings, with small pendants, that will make your face look thinner. In that case, avoid heavy long earrings- such as the ones with big stones. Have you ever thought that there are also different types of neck? No? It may sound strange, but they do exist different shapes of necks! And according to each type, we suggest to wear different kinds of long earrings. 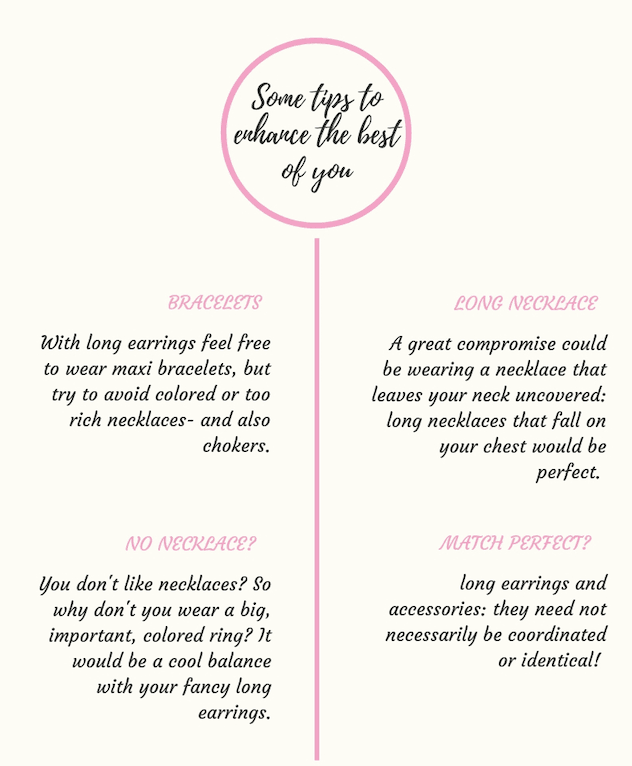 For example, if you have a short neck, long earrings are not the best accessory for you, but don't worry: we have tips also for you! If you want to wear them, just wear also a long thin necklace, and match them with simply clothes. Also long dresses are suggested, but only if they have a low neckline. This is a great trick also if you have a short neck: having your hair up, your neck will look a bit thinner and longer, so wearing long earrings will be so much easier! As you can see, wearing fancy long earrings is not difficult...with a few adjustment! 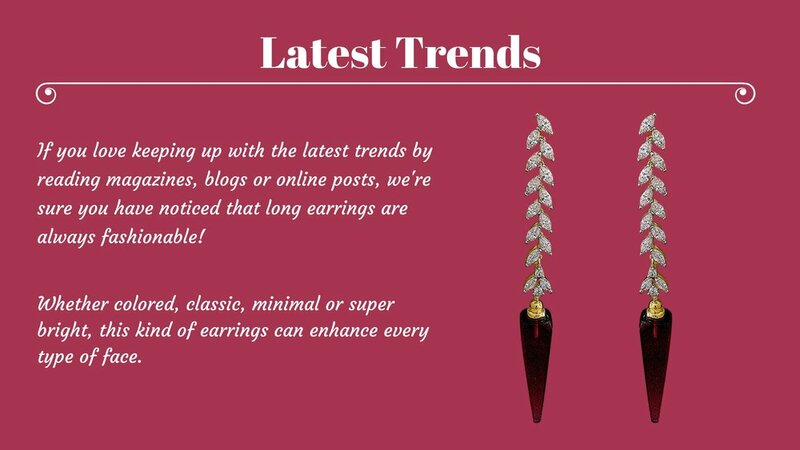 If you still have some doubts, just go and check long earrings online : you can draw inspiration from lots of pictures, and see how the trend of long earrings is always fashionable!